We've had a long successful history dating back to 1933. It all started back in 1933. Fort Lauderdale was growing and becoming one of the premier locations not only to vacation to but to call home. At that time, Septic Tanks were the main choice for answering the need of thousands. As time passed, New Installations, along with unparalleled service, quickly turned JOHNSON ENVIRONMENTAL SERVICES into an iconic name in South Florida. 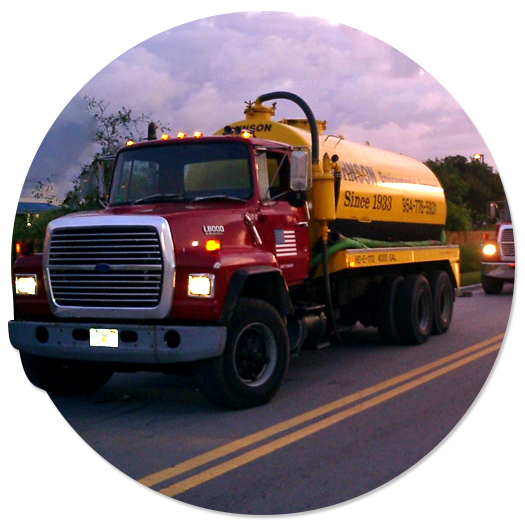 81 Years later, we're still here and we have grown to become premier liquid waste haulers in South Florida. In addition, we offer the following sales and services to Dade, Broward, and Palm Beach Counties. WE WILL BE THERE FOR YOU, ALWAYS! we are always available for whenever the unexpected happens. If you have an issue after normal closing hours, there is no need to worry, a qualified JOHNSON's technicians will be available to either answer your questions for formulate a response with the proper people and equipment. Also JOHNSON ENVIRONMENTAL SERVICES realizes that not all the challenges facing their customers can be done between 9AM to 5PM. Speak to a Johnson sales associate about any special scheduling needs you may have for our services. Remember, we will be there for you, Always! JOHNSON ENVIRONMENTAL SERVICE THESE FIVE WORDS WE SWEAR TO YOU! KEEPING YOU IN THE FLOW!